With ongoing advancements in technology, information technology jobs are often in high demand. Though some jobs are available to those who hold an associate or bachelor's degree, those who earn an online master's degree in information technology (IT) typically have more career options available to them. Find master's for information technology programs, see what a timeline for a master's in IT looks like and learn more about possible career paths below. Students interested in receiving an master’s degree in information technology (IT) but are have other time commitments that prevent them from being able to attend on-campus courses may benefit from enrolling in an online graduate program. However, with more schools offering distance learning programs, it can be overwhelming to know which school is best. To help with this process, we have ranked schools all over the country based on factors such as net price, graduation rates and availability of student resources. Explore the top-ranking schools that offer online master’s in IT programs below. Prospective graduate students looking to advance their expertise in instructional technology may consider enrolling in the master’s program at Carnegie Mellon University. This graduate program educates students on various technological processes in order to begin a career in areas such as civil services, community-based organization and government sectors. Students can complete programs in areas including mobility, information security and information networking. Courses are taught by experienced faculty who are well-versed in the field. The program also requires students to complete an INI-approved internship in order to apply their academics in a professional setting. 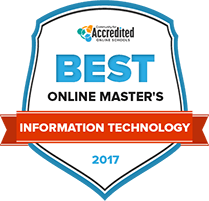 For those interested in an advanced graduate program in information technology and management can receive their master’s degree from the Illinois Institute of Technology. This graduate program is offered entirely online and allows students to choose from over 65 diverse courses and offers 11 different areas of focus such as software development, web design, data management and a general course study. The degree program is a 30-credit-hour curricula which is completed through ten courses. Online students can access course information, video conferencing, and exam scheduling through their academic management system, Blackboard. Distance learners are able to pursue their Master of Science in Information Sciences and Technologies degree through Rochester Institute of Technology’s graduate program. This program is comprised of 30 credit hours of graduate study along with a capstone experience, thesis, or project. Graduates of the program can expect to have advanced credentials and expertise in the field such as database technology, Web systems, information management and integration technologies. Students are also provided with support services through the school’s Academic Support Center where they can access academic coaching, supplemental instruction and the school’s mentorship program, Empower. Dedicated adults could earn a Master of Science in Information Technology within 21 months from Concordia University Wisconsin. Computer concepts, ethical computing, data networking, information technology security and network applications are topics that instructors lecture about. Plenty of hands on learning is one of the advantages that students receive. Each course in the 36 credit hour program takes 8 to 10 weeks to finish. Shorter, eight week courses require students to attend at least one class at the Mequon campus. These classes are held during evening hours. Technology majors could earn a Master of Science in Instructional Technology Management at LaSalle University. Careers that the master's degree prepares adults for are as instructional architects, designers, learning and development and human resources. Computer based innovations are a key part of the eight week training courses. Specific classes that help to prepare adults for instructional technology roles include principles of instructional design, web design, project management and professional media development. To complete the three credit hour capstone project, students can participate in an internship. Another option to complete the capstone project is to complete an instructional design. North Carolina State University Raleigh's Master of Geospatial Information Science and Technology degree is a professional science degree. Areas of focus in the program are computational sciences, project management, communications and technology applications. Ability to develop web, network and other computer designs is one key program takeaway. Instructional design skills is another program outcome. Adults who take classes that lead to the degree may participate in field work like the delineating food deserts project. Field work leans on classroom instruction and takes place alongside faculty. The 31 credit program is challenging, even for students with undergraduate technology degrees from widely respected schools. University of Michigan Dearborn's Master of Science in Information Systems and Technology degree is part of the university's 40 graduate degree offerings. The university is accredited by the Higher Learning Commission of the North Central Association of Colleges and Schools. Its 30 credit hour Master of Science in Information Systems and Technology degree is managed by the College of Engineering and Computer Science. Narrowly defined training is available in information management applications, web information, engineering information systems, supply chain and information security. Dual degree options are available. Master of Science in Information Technology students at Lawrence Technological University delivers instruction that helps adults to use technology to work with areas like finance, manufacturing and engineering to develop advanced business solutions. Students are assigned a faculty member who will mentor them. Academic advisors regularly meet with adult students who are accepted into the program. Online classes may make it possible for adults working full-time jobs to earn the degree. More than half of the 30 credits built into the program are core courses. Electives are in business analytics, information assurance, general topics and project management. Emerging trends, networking applications and advanced computer designs are built into the Master of Science in Information Technology degree at Endicott College. Learning outcomes in the 36 credit hour program equip graduates to understand and work with technological systems in challenging real life environments. Another learning outcome is to educate business leaders, educators and consultants on traditional, modern and developing technological tools and systems. Object oriented programming, managing virtual systems, project and professional management and fundamentals of telecommunications are degree specific classes that students need to pass to graduate. The quickest that the program can be completed is 15 months. At East Carolina University, many classes in the master's information technology program are delivered through Blackboard, the resource that the university uses to connect instructors and students taking virtual courses. Virtual classes are also mobile app friendly. The number of classrooms available to students and faculty exceeds 350. After enrolling in an information technology program, adults could earn a Master of Science in Software Engineering, a Master of Science in Technology Management or a Master of Science in Instructional Technology. A two year commitment is necessary to take all classes in the 36 credit hour program. Six semester hours of electives and a capstone program are built into the degree. In addition to a top-ranking list, a prospective student may need to consider other elements when searching for an online master's in IT program. The search tool covers the criteria that often matter most to potential students like school type, acceptance rates and student population. Aspiring students often choose to pursue a master's degree because it may open doors to jobs with more responsibility, pave the way for a promotion or raise, or allow those with some information technology knowledge to change career paths. Find out what students need to know about getting through the application process as well as what they can expect to learn during those important years of master's degree study below. Although the application process for an online master’s degree in information technology may vary from program to program, a list of common requirements in given below. Before entering an online master’s in IT program, a bachelor’s degree will typically be required. While this does not usually have to be in information technology or a related field, having an IT-related bachelor’s degree may help the chances of admission. Schools will often require an official transcript, either as hard copy or an electronic copy, and will often request it to be sent directly from the awarding institution. Some information technology programs require a student to complete the GRE and submit their scores in order to be reviewed for admission. Some might require the GMAT in addition to, or in place of, the GRE. The test usually needs to be taken within five years of the date of admission, and in some cases, schools might require a more recent test. Letters of recommendation should generally come from those who know the applicant best in terms of the IT field, including colleagues, former professors or supervisors. Though the student is often required to collect these letters, some schools will require students to simply provide contact information for those individuals, and the school will contact them to obtain the letters of recommendation. A résumé detailing work in the field is often a requirement. Some schools may want to see a significant amount of work in information technology before a student can be admitted. Others may simply want to know that the student is attempting to build up a strong background of experience. The personal statement can give students an opportunity to state why they want to enter an online master’s program in information technology and what they intend to do with their degree. Some schools will require an interview with the admissions committee. This interview might be conducted in person or might be handled through online video chat programs. Most online information technology master’s programs can be completed in two years. However, those who choose to attend part-time could take three or more years, and those who take accelerated courses could graduate in less than two years. See what to expect during the first year of study in a standard two-year timeline below. The core courses in a master’s program often set a firm foundation for the future concentration courses. These core courses typically cover many points necessary for IT professionals like programming languages. Students will typically begin looking at concentrations and choosing which one will suit their educational and professional goals. Concentrations can include a huge variety of options, including business intelligence and analytics, cyber security management, IT consulting and services management, and healthcare systems. The thesis or capstone project is a major part of an online master’s in information technology program. This will usually require in-depth research and writing on a particular subject in information technology, preferably one that focuses on a student’s ultimate career goals. Students often consult closely with advisors to determine which thesis or capstone subject might be best. In their second year, information technology master’s students typically pursue the concentration that was chosen during the first year. The classes during the second year will likely be more targeted and detailed than the core courses of the first year and will typically prepare students to move into the information technology world with practical skills as well as the potential to become leaders in the field. See an example of what a student can expect in the second year below. Concentration is typically the main focus during the second year of study. Students can choose from options like e-commerce, IT teacher education and telecommunications. Some more specialized concentrations delve into very specific areas, such as bioinformatics or those under the umbrella of bioengineering. The majority of courses in this year are usually directly related to a student’s concentration. Students will likely be completing the capstone project or thesis, which means a great deal of time will be spent finishing up the research and writing necessary for the final report. Courses designed to help a student along the way will typically be offered during both years and will focus on research methods and advanced writing techniques. Often times, additional certifications may be required in order to apply for certain job in the IT field. From Certified Information Systems Auditor (CISA) to The Open Group Architecture Framework (TOGAF) to certifications in various programming languages, the proper certification to obtain usually depends on the concentration and eventual career the student will pursue. In addition to completing the required courses set forth by the program, students will typically have to meet other requirements in order to be eligible for a degree. Below are some of the most common requirements for those in an online master’s in information technology program. The thesis or capstone project is typically required for graduation as it sums up the skills and knowledge a student learned during the program and demonstrates a strong grasp of key concepts. The thesis or capstone project is usually completed during the second year, but some students choose to expand their education into a third year in order to accommodate the need for in-depth research. In most concentration courses, an overall minimum GPA of 3.0 on a 4.0 scale is required, but it might be higher depending on the school. Some programs not only require the completion of a thesis or capstone project, but may also require the passing of an examination. Comprehensive exams will typically cover the basic information students should have learned during the program like programming languages and leadership development. Many schools will require a student to have hands-on training before graduation, which is usually obtained through internships. Students in the online program can often complete these internships through a variety of companies that have partnered with their online school to provide the experience for promising young IT professionals. Internships are often completed between the first and second year. These managers typically work to plan, coordinate and direct the computer-related activities for an organization or business. Duties can include determining what a company needs, planning and directing the implementation of new technologies, creating cost assessments, working to enhance security, directing other IT professionals who work for the business and working with executives to plan growth of technologies over time. These individuals usually have a high level of technology expertise they use to evaluate new technologies and figure out how they might benefit an organization. They often design and implement proper solutions for various departments, determine an overall strategy for IT and oversee research and development activities. These professionals often analyze the role of IT in an organization, research emerging technologies, create cost assessments for clients, work with older computer systems to make them more powerful as well as plan, design, install, test, and maintain new computer systems that provide the client with the computing power they need to help their business grow. An online master's degree in IT can bring an intimate understanding of the industry into the workplace. From the development of new technologies to how to make old technologies work in different ways, students will typically learn how to best use their IT knowledge to create value for their clients. Those who took several management classes during their master's in information technology program can typically apply those skills in a leadership role in their company or organization or form their own small business. No matter the job, an online master's degree in IT will typically give students a strong overview of the various technologies available to IT professionals and how to use them. Graduates typically gain specialized knowledge, including advanced programming languages, in-depth security measures and complex data mining work. Women who choose to enter this field, which has traditionally been dominated by men, can find numerous resources through this association. This association works to enhance and advance the IT profession through support of IT education, national policies on IT and professional development of its members. This non-profit trade association focuses on supporting businesses, from the largest vendors to the smallest start-ups, in the hopes of advancing industry growth and innovation. Considered the global voice of the tech sector, ITI advocates for strong tech policies that enhance the opportunities for technology professionals around the world. Those who choose to focus on software development can find a great deal of support through SDF. This forum offers a place to ask questions that only a fellow software developer can answer.